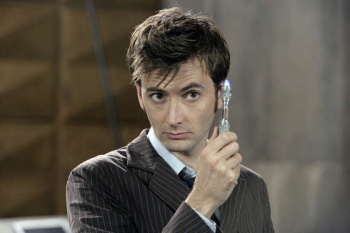 Have you always hoped and dreamed of owning a Sonic Screwdriver? Well, it's not going to happen anytime soon, but you might get to have one eventually. If you've ever watched a single episode of Doctor Who, you've seen The Doctor bust out his Sonic Screwdriver to do ... well, just about anything really. Fans of the show will probably be excited to learn that a British university professor is working to (eventually) make the device a reality. For the moment, Bruce Drinkwater (a professor of ultrasonics at Bristol University), is working to prove that the concept of a Sonic Screwdriver is at least possible. Drinkwater wants to build on pre-existing research that uses ultrasonic waves to move small objects and separate diseased cells from healthy ones. The theory is that ultrasound could be used to simulate the mechanics of a real screwdriver. A rotating forcefield could perform the function of a head, while spinning ultrasonic waves at high speed could create a tornado-like force to turn the screws. I've got a pretty limited science background, but it sounds like this is pretty plausible. Drinkwater is apparently hoping the Doctor Who connection will get kids to become more interested in science and engineering. That sounds like some pretty solid logic, too.